Alex Seff finished with 20 points and 11 rebounds for his first double-double of the season, as the Vassar College men's basketball team (9-12, 5-9 Liberty) earned a 61-55 victory over host Union. SCHENECTADY – Alex Seff finished with 20 points and 11 rebounds for his first double-double of the season, as the Vassar College men’s basketball team (9-12, 5-9 Liberty) earned a 61-55 victory over host Union (8-12, 4-10 Liberty) at the Viniar Athletic Center on Saturday afternoon. With the win, the Brewers snapped a seven-game losing streak against the Dutchmen. Vassar jumped out to an early 8-3 lead, but Union responded with a 9-2 run to go up 12-10. Hugh Durham answered with a trey, though, starting a 10-2 rally that gave the Brewers a 20-14 cushion midway through the first half. The Dutchmen scored the next six points to level the score at 20-20, and it would be tied twice more before Vassar ended the half on a 9-4 spurt to take a 33-28 advantage into the locker room. 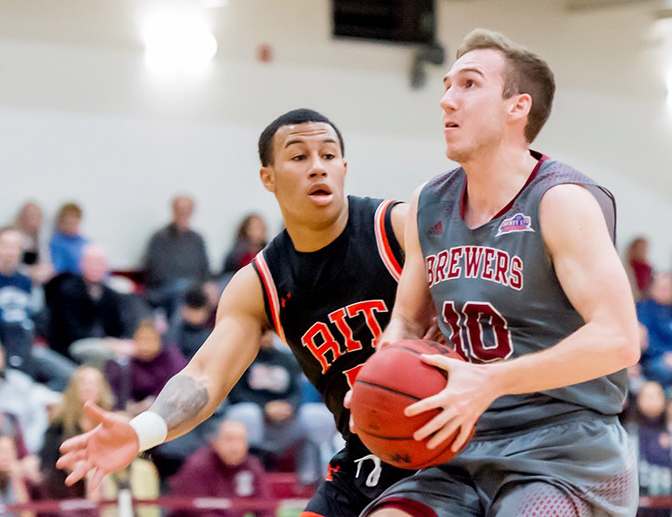 After a Seff layup pushed the Brewers’ lead to a game-high nine points, 43-34, with 12:01 remaining, Union outscored Vassar 16-8 over the next seven minutes to pull within one, 51-50. It was still a one-point game, 54-53, when Chris Gallivan sank a pair of free throws at the 2:09 mark. Mason Dyslin then put in a layup to increase the margin to five points, 58-53, before Seff scored Vassar’s final three points in the 61-55 triumph at the line. Three Brewers reached double-figures in the scoring column, led by Seff’s fourth 20-point effort of the season. Lance Tebay tallied 14 points, while Dyslin had 10 points to go along with six rebounds and three assists. Paul Grinde handed out four assists and pulled down a game-high 12 boards, as Vassar held a 45-35 edge on the glass. The Brewers shot 39.1 percent (18-of-46) from the floor, 30 percent (6-of-20) from long range, and 63.3 percent (19-of-30) at the charity stripe. For Union, Kevin McNoble registered a double-double with 10 points and 12 rebounds. He also distributed six assists. Nate Freeman notched a team-best 11 points, and Brendan Laing chipped in 10 points. The Dutchmen were held to 28.8 percent (19-of-66) shooting, including 20.7 percent (6-of-29) from beyond the arc. Union went 11-for-15 (73.3 percent) at the free throw line. The Brewers continue their four-game road trip on Friday, when they visit RIT (5-14, 2-10 Liberty) at 7 p.m.